Rinke, Stefan; Schulze, Frederik: Kleine Geschichte Brasiliens. München : C.H. Beck Verlag 2013 ISBN 978-3-406-64441-2, 232 S. € 12,95. Prutsch, Ursula; Rodrigues-Moura, Enrique: Brasilien. Eine Kulturgeschichte. Bielefeld : Transcript – Verlag für Kommunikation, Kultur und soziale Praxis 2013 ISBN 978-3-8376-2391-8, 261 S. € 24,80. Since the early 2000s, Brazil has gained in global stature. Observers hailed the 2002 election of a former metalworker, Luiz Inácio ‘Lula’ da Silva, to the country’s presidency as a sign of a mature democracy. International admiration only grew when Lula’s center-left government, building on the economic and political reforms of the 1990s, expanded social welfare and oversaw a sustained economic boom. The result was a fast-growing middle class and a reduction in the country’s historically extreme income inequalities. The inclusion in the BRIC group of newly advanced economies, and – more recently – the awarding of the hosting rights for the 2014 FIFA World Cup and the 2016 Olympic Games, served as recognitions of Brazil’s new status as a significant global player. This renewed interest in Brazil has led to an outpouring of books on the country, most of them journalistic accounts, travel guides, or light-hearted introductions to Brazilian culture. However, we still lack up-to-date texts that introduce the educated reader to the history of Brazil in an accessible yet academically rigorous way. Even in the United States, the world’s largest market for educational textbooks, no volume published in the last ten years offers comprehensive coverage of Brazilian history. For the German-speaking market, where Brazil has long been academically marginal, two new books under review here aim to close that gap. In their effort to capture the complexity inherent to the history of a country of continental proportions, they differ greatly in their approach and style. Stefan Rinke’s and Frederik Schulze’s “Kleine Geschichte Brasiliens” offers a comprehensive survey from pre-colonial times to the present. It provides an historical synthesis whose narrative focuses on social, economic, and political history, but it also covers cultural, intellectual, and transnational aspects. In contrast, Ursula Prutsch‘s and Enrique Rodrigues-Moura‘s “Brasilien: Eine Kulturgeschichte” uses lively historical vignettes for each period to provide the reader with a sense of the key social and cultural issues. These are very deliberately snapshots, not a synthesis, and they draw on Brazil’s ample cultural production – from classic literary texts to TV soaps (telenovelas) – to illustrate their points. One could argue that these differences in approach and organization of the books reflect different historiographical viewpoints (Geschichtsverständnisse). They certainly reflect different target audiences. 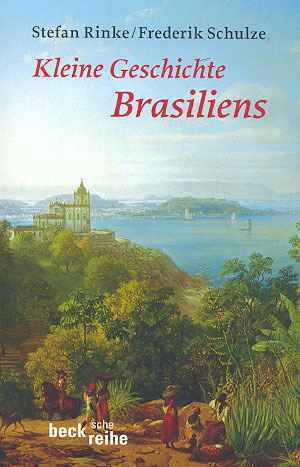 “Kleine Geschichte Brasiliens” is a book by historians for historians – and for anybody interested in Brazil who believes that we cannot make sense of a country unless we understand the major economic, political, and social forces that have shaped its past. The chronological division of the chapters follows conventional lines, with some interesting and very sensible variations. In a nod to the booming scholarship on the revolutionary era in the Atlantic World, the half-century before independence (1777–1822) receives special attention in a chapter separate from the coverage of the colonial period. After the obligatory chapter on the Empire (1822–1889), both chapter organization and titles for the long 20th century reflect the global dimension of Brazilian history: “From Globalization to Nationalism (1889–1945)”, “Brazil in the Cold War (1945–1989)”, and “Brazil in the New Globalization (since 1990).” The threads for each chapter narrative offer few surprises, but the authors of this comparatively brief volume deserve praise for covering the main themes concisely without oversimplifying. Importantly, they incorporate recent scholarship on key cultural and intellectual developments to give the predominantly socio-economic and political narrative greater historiographical balance. The final chapter on historiographical trends and the selected bibliography for each chapter give the reader a sense of the sources that informed the book’s interpretations. The authors display keen judgment regarding historiographically controversial subjects. The Cold War chapter resists the temptation to present the 1964 military coup as a major dividing line, a view still prevalent in the Brazilian historiography driven above all by domestic political concerns and an inward-looking historical memory. Conceptually, the book avoids the facile dichotomy democracy-versus-dictatorship that has colored many, especially recent, interpretations of Brazil in the 20th century. “Kleine Geschichte Brasiliens” characterizes the “Estado Novo” (1937–45) as a “system that one could describe as authoritarian, bureaucratic, nationalist, populist, corporatist, and developmentalist” (p. 138), and it attests to Vargas’ “authoritarian style of leadership” (p. 139), but it does not call him a dictator. As for the transition from the military regime (1964–85) to civilian rule, the book acknowledges that it occurred without “direct democratic participation” (p. 182) and that the “military remained in control until the very end” (p. 185). The text recognizes the role of social movements in that process, but it does not exaggerate their ability to challenge a powerful state, an altogether more sanguine interpretation than presenting them as the key force in the transition. “Brasilien: Eine Kulturgeschichte” aims to reach “a broader interested public”, to quote the publisher’s statement on the target groups for the series, although it may also work well as a general introduction to Brazilian culture in an academic setting. The book stands in a long tradition of defining Brazil primarily through its culture, dating back to Gilberto Freyre’s studies of racial mixing in colonial times. Popular culture – whether carnival, samba, candomblé, and more recently soccer and telenovelas – has long been portrayed as the essence of being Brazilian and thus a privileged entry point to understand the country’s social history. Taking a long historical view of Brazilian culture, the authors refute the idea of a country that is “geschichtslos” (p. 11), translatable as “country without history” and/or as “country without a conscience of its history.” The book highlights two diametrically opposed tropes that have shaped popular (and some academic) narratives about Brazil: on the one hand an utter confidence in its future greatness, and on the other certainty of failure in its quest for greatness (p.10). Several vignettes foreground these two tropes, among them one highlighting President Fernando Henrique Cardoso’s (1995–2003) displeasure with a 2002 Simpsons episode that revived the image of Brazil as the country of carnival and kidnappings. The reader cannot but wonder whether the prominence of these tropes suggests that Brazil may have some ways to go in learning the lessons of its actual history. 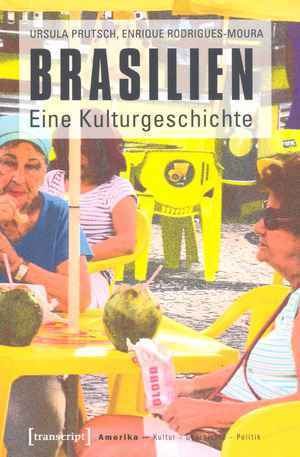 While it is delightful and stimulating to read, “Brasilien: Eine Kulturgeschichte” does not offer a “comprehensive cultural history” (“umfassende Kulturgeschichte”) of Brazil, as promised on its back cover. Vignettes that highlight particular historical episodes, but without an overarching narrative, cannot deliver “comprehensive” coverage. The introduction suggests that synthetic interpretation is the goal when it poses the question whether Brazil’s great confidence today is the result of “short-term developments or of a long historical process” (p. 9). However, it is difficult to imagine how a book of historical snapshots could provide the answer. Academic historians may object to the lack of references. Presumably, each vignette draws on a variety of academic sources, but the book does not offer suggestions for further reading apart from a general bibliography. Some vignettes, especially those on the 20th century, bring together topics that appear to lack a tight analytical connection. What links Ayrton Senna’s death and the currency reform Plano Real, for example, other than that both occurred in 1994? Many readers will appreciate this evocative style of “Brasilien: Eine Kulturgeschichte”, but it would be easier to accept the book on its own terms were it not for the promise of “a (comprehensive) cultural history”. Both books have their merits, but the academic historian will find “Kleine Geschichte Brasiliens” to offer greater depth and rigor. Oliver Dinius: Rezension zu: Rinke, Stefan; Schulze, Frederik: Kleine Geschichte Brasiliens. München 2013 / Prutsch, Ursula; Rodrigues-Moura, Enrique: Brasilien. Eine Kulturgeschichte. Bielefeld 2013 , in: H-Soz-Kult, 04.07.2014, <www.hsozkult.de/publicationreview/id/rezbuecher-20648>.